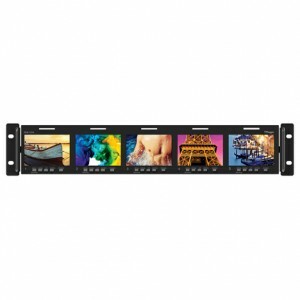 TVLogic RKM series of professional multiple video displays in a 19″ rackmount enclosure. 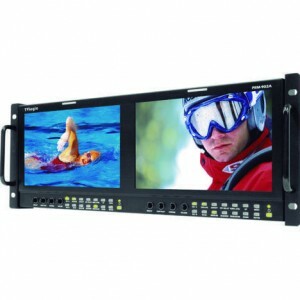 Rack-mountable monitors with 3G-SDI capability and professional features such as Audio Level Meter, Time Code Display, Waveform/Vectorscopes etc. 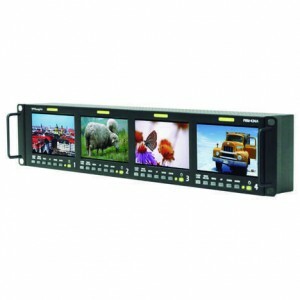 TVlogic RKM-443A UK List Price: £3,960 +VAT. The compact RKM-443A packs four 4.3” 800×480 LED backlight LCD panels into a 2RU rack unit designed for SDI signal monitoring. The front panel allows selection of Embedded Audio Level Meter, Waveform/Vectorscope and the PRM full feature/setup menu. I/O includes SDI in/out, serial tally port and serial firmware upgrade port. 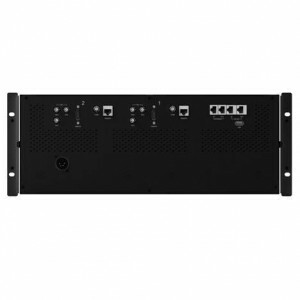 TVlogic RKM-535A UK List Price: £4,757 +VAT. The compact RKM-535A packs five 3.5” 960×640 LED backlight LCD panels into a 2RU rack unit designed for SDI signal monitoring. The front panel allows selection of Embedded Audio Level Meter, Waveform/Vectorscope and the PRM full feature/setup menu. I/O includes SDI in/out, serial tally port and serial firmware upgrade port. TVlogic RKM-356A UK List Price: £3,654 +VAT. 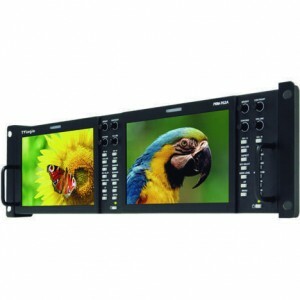 A brand-new rack-mount monitor with 3 × 5.6″ LCD screens, which has the same high performance display as VFM-056WP. High resolution of 1280 x 800 and wide viewing angle. It supports SDI in/out and HDMI input. TVlogic RKM-270A UK List Price: £2,752 +VAT. 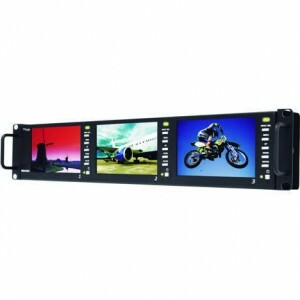 A brand-new rack-mount monitor with 2 × 7″ LCD screens, which has the same high performance display as LVM- 074W. Wide viewing angle IPS LCD with 1024 x 600 resolution. It supports SDI in/out and HDMI input. TVlogic RKM-290A UK List Price: £3,664 +VAT. 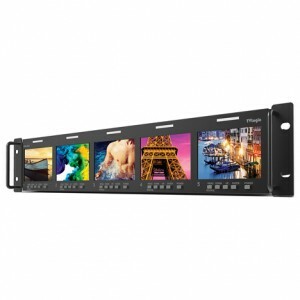 A brand-new rack-mount monitor with 2 × 9″ LCD screens. which has the same high performance display as LVM- 095W-N with full HD resolution and wide viewing angle capability. It supports SDI in/out and HDMI input. TVlogic PRM-207Q UK List Price: £8,124 +VAT. 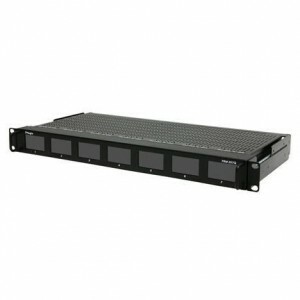 The TVLogic PRM-207Q features seven 960×540 LED backlit LCD panels built into a 1U sliding rack mount kit. Seven I/O's include SDI in with one SDI loop-out, UMD (Under Monitor Display), and serial firmware upgrade port. Menu selection buttons are accessed on the top of the monitor with sliding rack mount kit. TVlogic PRM-902Q UK List Price: £4,304 +VAT. 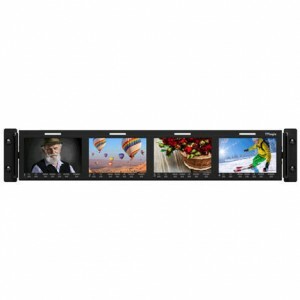 The TVLogic PRM-902Q features two 960×540 (exactly ½ 1920×1080) resolution high contrast (1000:1) LCD panels in a 4RU rack mount with 90° tilt range, 2x HD/SD-SDI Auto switching inputs, Analogue Inputs (Composite, S-Video, YPbPr), RGB 16.7 million colour support, Closed Captioning Support (CEA-608/708), Waveform & Vectorscope, Active Format Description Support, H/V Delay, Markers and Safety, Embedded Audio Metering (8 ch), Timecode display (VITC & LC), Auto Colour Calibration Support, and more. TVlogic PRM-902A UK List Price: £3,348 +VAT. 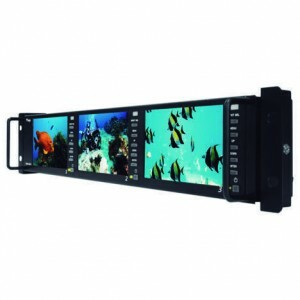 Featuring two 9” 800×480 CCFL backlight LCD panels with 90° tilt range, the 4RU TVLogic PRM-902A provides front panel individual control of Brightness, Contrast, Chroma, SDI A/B select, Analogue, Aspect select (16:9, 4:3), H/V Delay, Embedded Audio Level Meter, Various Scan Modes(Over,Zero, 1:1), user selectable Marker, Blue/Mono, Waveform/Vectorscope and the PRM full feature/setup menu. 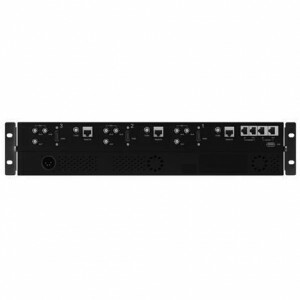 Inputs include two SDI with active loop through plus Component analogue, S-Video, RGB, three Composite analogue inputs, RJ11 Remote Control and serial firmware upgrade port. Outputs include one SDI and one stereo mini audio out. 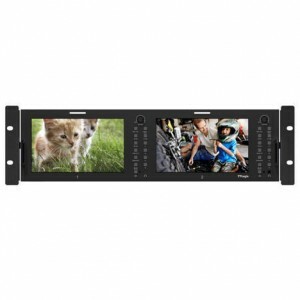 TVlogic PRM-702A UK List Price: £3,143 +VAT. 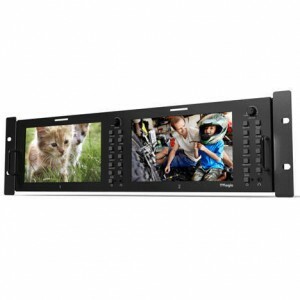 The TVLogic PRM-702A features two 7” 800×480 with LED backlit LCD panels with 90° tilt range in a 3U rackmount chassis. Inputs include two SDI with active loop through plus Component analogue, S-Video, RGB and three Composite analogue inputs, RJ11 remote control and serial firmware upgrade port. Outputs include one SDI and one stereo mini audio out. TVlogic PRM-503A UK List Price: £4,099 +VAT. 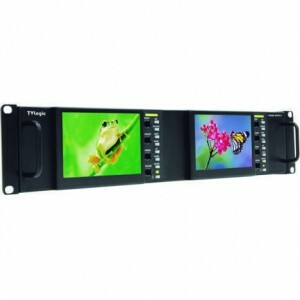 The TVLogic PRM-503A consists of 3 x 5” 800×480 LED backlit LCD panels with 90° tilt range. Input selection and full PRM series feature-set menu are accessed via front panel. I/O includes two SDI in with one SDI loop out, one CVBS in, one CVBS loop out, RJ11 remote control and serial firmware upgrade port. TVlogic PRM-502LE UK List Price: £1,913 +VAT. 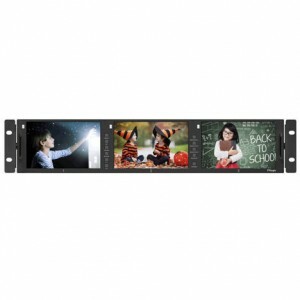 Dual 5” 800×480 LED backlit LCD panels with 90° tilt range are included in the TVLogic PRM-502A, which offers front panel individual control of Brightness, Contrast, Chroma, Aperture, SDI A/B select, Analogue, User (assignable feature), and feature/setup menu. I/O includes two SDI with active loop through and one SDI out plus Component analogue, RGB, three Composite analogue inputs, and serial firmware upgrade port. Three 4.8” 800×480 LED backlit LCD panels with 24° tilt range are included in the TVLogic PRM-483A. Input selection and full PRM series feature-set menu are accessed via the front panel. I/O includes two SDI in with one SDI loop out, one CVBS in, one CVBS loop out, RJ11 remote control, and serial firmware upgrade port. TVlogic PRM-434A UK List Price: £3,826 +VAT. 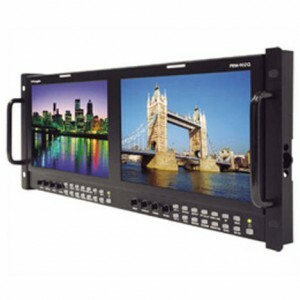 The compact PRM-434A packs four 4.3” 800×480 LED backlight LCD panels into a 2RU rack unit designed for SDI signal monitoring. The front panel allows selection of Embedded Audio Level Meter, Waveform/Vectorscope and the PRM full feature/setup menu. I/O includes SDI in/out, serial tally port and serial firmware upgrade port.